There are many benefits to Equine Zeo as a nutrition supplement, here are a few of those in further detail, how and why this premium product works backed up with scientific research. A main characteristic of Clinoptilolite is its high pH level. Its pH level ranges from 7.0-8.0 which makes it alkaline and similar to the healthy blood pH level of 7.4.2–7.45. Therefore it is suggested that Zeolite can assist in balancing a healthy acid-base homeostasis in the body. Due to the nature of feeding, such as a high in concentrate diet, the horses stomach is extremely acidic and any help to increase the alkalinity would improve the welfare of the horse. A research paper written by J. Reynolds discussed how a diet including Clinoptilolite showed packed cell volume (PCV) and heart rate (HR) during prolonged exercise did not rise, against a diet containing no clinoptilolite. With this in mind, maintaining HR as exercise intensifies will delay the onset of fatigue through a slower build up of lactate. Link this with improved nutrient uptake and you can see how this product would benefit the performance horse. Clinoptilolite is known as the molecular sieve as it traps and removes harmful everyday toxins as well as residual toxins that may be lingering in the body from medication. Daily detoxification is a great support to the horse and increases the performance of all bodily functions, especially the immune system. article/pii/B9780128118351000026), the chemical compounds are stable and will survive many treatments. You will find them in hay, pasture and your feed as many storage facilities will facilitate the growth, this is why Equine zeo is fantastic for improved nutrient uptake as it will trap and hold the mycotoxins, allowing the necessary nutrients to be absorbed without obstacles. Greater nutrient uptake will ultimately assist performance as the building blocks for competition, as found in many feeds, will be reached by the required storage units of energy such as the muscles and liver. Any equine sport places enormous pressure on the musculoskeletal system of the horse. 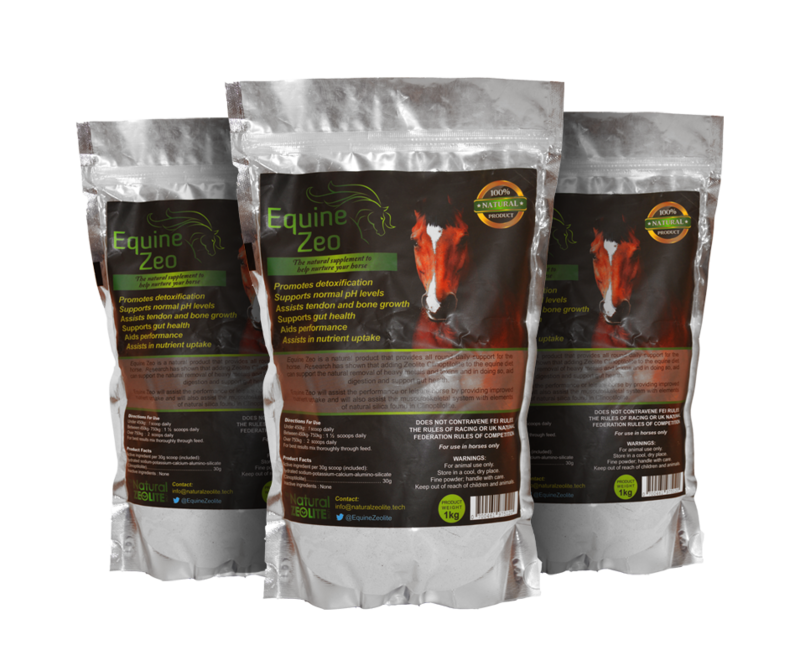 Adding Equine Zeo to the diet can assist in improving net bone formation in young horses and can assist in regeneration in older horses. A piece of research by Lang et al (2001), showed decreased bone resorption which would provide for greater net bone formation, due to the silica element found in Clinoptilolite. A new research paper has been written about the benefits of feeding performance horses a high quality Zeolite Clinoptilolite such as Equine Zeo. The paper will be published in 2018 and will be uploaded to this site. "Thank you so much. 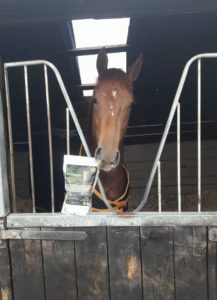 He may Not be a racehorse but since my boy has been on your product he no longer gets heat lumps under his saddle and his coat is absolutely gleaming." "Excellent Product – I’ve tried every gastric supplement on the market for my stressy mare and this one really works. It’s the best support for healthy digestion and a fraction of the price of other gastric aids. Finally my horse is calm, happy and healthy – before she was on equine zeo this horse was like sitting on a box of explosives. Now I’m hacking on the buckle and getting calm concentration in the school. Thank you equine zeo!" 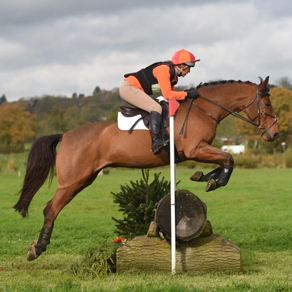 "Great Product – My horse had a redworm issue in May, causing ulcers and hindgut issues, and diarrhoea, having tried various products, I came across Equine Zeo. He has been on it for 4 weeks now, finally no diarrhoea 👍 and much more comfortable in himself and happy to work again, I wouldn’t be without it. Thanks." "Since starting on the product we see our horses improve in their condition and they are handling their racing better than ever. 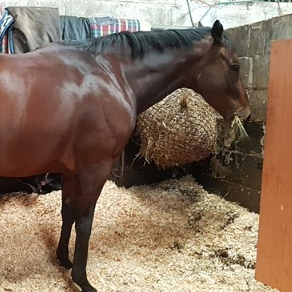 We weigh our horses before and after racing and have seen the benefits of Equine Zeo as our horses are returning to their racing weight quicker than before." "Extremely happy with this product as our horses look fantastic and we know that our horses are healthy on this product. It is great value and they put money back into racing via Racing welfare. A great company with extremely helpful staff." "Love this product! My mare is performing better than ever and is now competing at a higher level. She loves the product and looks amazing all year round. I recommend this product as it is natural and the staff are always there to support us." "We put our horses on this product after hearing great things, especially with its support against ulcers. Our horses are performing better than ever and we know they are in great health and are loving their racing. Thanks Equine Zeo!"